Hans Wijbrand Hoek, MD PhD, is a consultant psychiatrist (1990), a certified epidemiologist and group psychotherapist. He is chair of the Parnassia Academy and director of psychiatric residency of Parnassia Psychiatric Institute (Parnassia Groep) in The Hague, as well as professor of psychiatry at the University of Groningen. He holds an adjunct position as professor of epidemiology at Columbia University, Mailman School of Public Health, New York. 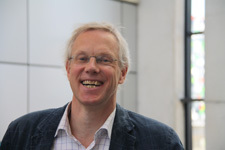 Hans Wijbrand Hoek has published extensively, particularly in the fields of eating disorders and psychosis.His main research topics are the epidemiology, neurobiology and treatment of eating disorders. He has a special interest in transcultural psychiatry. He is involved in the Global Burden of Disease Study 2013 (and its predecessor GBD 2010). Hans Wijbrand Hoek was involved in the development of the DSM-5 as a member of the DSM-5 Eating Disorders Work Group and of the DSM-5 Impairment and Disability Study Group. He is past president of the Eating Disorders Research Society and was the recipient of the Academy of Eating Disorders Research Award 2011. He is a member of the editorial board for four eating disorders journals, as well as section editor Eating Disorders for Current Opinion in Psychiatry. He is past chairman of the Steering Group on Eating Disorders in the Netherlands, set up by the Dutch Ministry of Health. He is a consultant for the World Health Organization for the development of the WHODAS 2.0. Body Mass Index Trajectories from Adolescence to Early Young Adulthood: Do Adverse Life Events Play a Role?